KeePass2 is an application that allows you to store, manage, and generate strong passwords for your websites and applications, securely and easily. In a previous guide, we discussed how to use kpcli to interact with KeePass database files on a remote server. In this guide, we will set up the server to provide secure access to our database file with nginx. 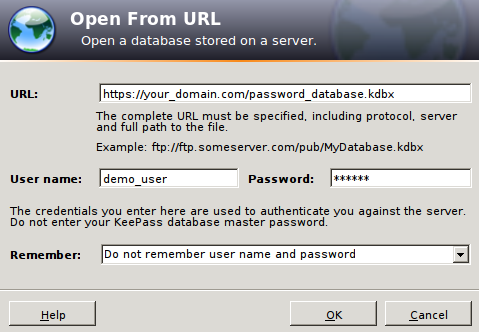 We will then show you how to connect to and use this remote database file with a local installation of KeePass2. This will let you keep your passwords in a secure location while still allowing you to access the database from any of your devices. As a prerequisite to this tutorial, we assume that you have completed the previous guide and have a KeePass2 database file on your remote server. Now, we need to configure a web server to provide secure access to our file. We will be using nginx in this guide. This will download and install the web server. We will be securing our communication with the server by using SSL. This will encrypt our data during transfer so that outside parties cannot read our password information. This will ask you a series of questions about your site. Answer them as best as you can. The most important question is the one that reads Common Name (e.g. server FQDN or YOUR name). This is asking for the domain name or IP address of your server. When you are finished, you will have two files called nginx.key and nginx.crt in your /etc/nginx/ssl directory. We now have SSL certificates to encrypt our communications to our server. However, we also need to implement a mechanism for authenticating ourselves to the server. We do not want to allow just anyone to access our passwords database. This will install the htpasswd tool, which can be used to create secure password files that our web server can read and understand. This will create a file called htpasswd in the /etc/nginx directory, with an entry for a user called demo_user. The user account can be anything you'd like. It does not have to be a user that exists as a system account. We will be serving a file called password_database.kdbx. We will assume that this file is in your home directory. Note: At this point, you should log out and log back in so that the system will recognize your new group membership. Our directories and files should now be configured correctly. The web server is the user and group owner of the directory. The web server is the group owner of all files. The web server will be given group ownership of new files created in the directory. We can now set up our nginx configuration to serve this directory. Now, we're ready to create our Nginx configuration. Inside, we will create two server blocks. You can delete the other contents or comment them out. This tells the server that for any regular requests coming in on port 80, we want to send the request, in full, straight to port 443 to wrap it in SSL. This first portion sets up the block as an SSL server. It does standard things like set the log location, set the server name, set the document root to the directory we created, and specify the SSL certificate and key that we created. Below this, a location block uses the password file we created to restrict access to our directory. Finally, we set up some WebDAV methods that will allow our KeePass2 application to read, modify, and save the data back to the sever. When you are finished, save and close the file. We are now ready to configure our client-side application. If you haven't already done so, you need to download and install the KeePass2 program onto your local computer. This will allow you to interact with our remote database file. 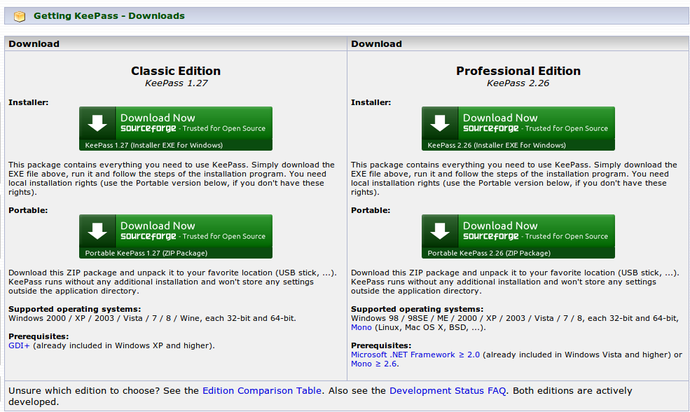 This will install the KeePass2 application on your local Ubuntu machine. If you are using Windows or OS X on your local computer, you can get the latest release of the KeePass2 application by visiting the Keepass website. Click on the "Downloads" link in the left navigation bar. You may have to go through some extra steps to get the application up and running. Follow the instructions for your operating system. Now that you have the KeePass2 application installed, start the application. The first thing that we will need to do is tell our application to accept SSL certificates that cannot be verified. Since our SSL certificate was self-signed, it is not signed by any certificate authority in our system's list of trusted certificate authorities. We can tell KeePass that we are okay with this by modifying a setting. Click on "OK" to implement your changes. Now, we are ready to connect to our file. You will be given a dialog box that asks you to fill in the URL and authentication information. If you named your database file something different, adjust as necessary. For the username and password, enter the account details that you chose for the htpasswd command to secure the nginx directory location. When you connect, you will be then asked for the master password for your database file. This is the password that you selected to protect your database file. You can now modify and use the passwords and credentials in the database on your local machine. You can write changes back into the file and they will be stored on your remote server. 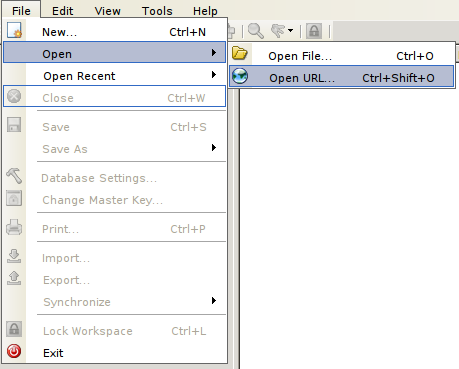 You should now have a fairly good way to access your database file. Using a remote database file will help you keep your password databases in sync across devices. It is absolutely essential that you back up your file to several secure locations to avoid losing your login credentials in case of server problems or file corruption. I recommend that you implement an automated syncing system like lsync or BitTorrent Sync to handle the automatic mirroring. You should also think of implementing a separate backup mechanism that stores previous versions of the file in case your database file becomes corrupted and the changes are synced to your other locations. Effective password management is essential in keeping your accounts and online identities secure. While there are many password management solutions that work on either a local computer or using a web service, these both have their drawbacks. In this series, we will demonstrate how to use some tools to make KeePass2, an open source local password management solution, available on a web-accessible server for remote use. Using a password manager allows you to create and keep track of complex passwords for your various accounts, which allows you to implement better security practices easier. KeePass2 is a piece of software that lets you create your own password database files for managing this information. In this guide, we'll look at a tool called `kpcli` which will allow you to create and manipulate KeePass2 database files in a server environment from the command line. KeePass2 is a password management system that can be used to store and manage many complex passwords and in an easy to use database structure. In this guide, we'll discuss how to use Nginx to securely serve your password database so that you can connect to it through a local KeePass2 application instance.